SD Memory Cards are becoming an enigma. Selecting the right Memory Card for your camera and your purpose may seem like a daunting proposition these days. What size? What speed? Which manufacturer? And what on earth do those numbers and symbols written on the card mean? There seems to be no end to the path manufacturing companies would take to confuse you like hell. If you do not remember what that feels like, just visit your nearby camera store and walk down the SD Memory Card aisle; or even better just browse through some cards right now on Amazon and you will know what I am talking about. Many manufacturers, many claims, many weird symbols and even more numbers. For anyone new in photography or film-making, it is a jungle out there. Getting lost and buying a card that doesn’t fit your needs or buying something that is way overpriced and something that you do NOT even need…can you really blame anyone? Probably not. This is the end my friend; all the confusion ends here, right now. I will tell you everything you need to know to make a better purchase when it comes to SD Memory Cards so that you do not have to guess or spend an obnoxious amount of money just to be on the ‘safe’ side. ‘SD’ in SD Memory Card stands for Secure Digital Memory. It was first introduced in the year 1999 by the SD card association for use in small portable devices. In those days, cameras and other electronic devices used various kinds of Memory Cards. These cards were of all different shapes and sizes and had different electronic configurations. The choice primarily rested with the manufacturer of that device. Compact flash, memory stick, smart media, just to name a few. Because these cards couldn’t be used interchangeably across devices, it really made using them very cumbersome and difficult especially when one person used multiples cameras from different manufacturers. The name ‘Secure Digital’ comes from the fact that these cards support DRM for music. However, when these cards first hit the market, people started to take notice of them for a whole different reason…. form factor. The SD Memory Cards were much smaller than any of the other flash storage medium available then. 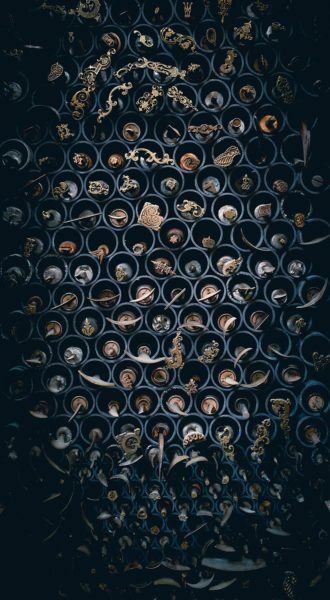 They could not only house much more storage but were extremely rugged and easier to use. Because SD Memory was such an open standard, it was cheaper for manufacturers to introduce it into their own products. Cameras, GPS systems, cell phones all started to use SD Memory Cards. Okay, let’s come back to the present now. SD Memory Cards can be broadly classified into two criteria. SD Memory Cards can be divided into three large categories depending on their storage capacities. SDSC and SDHC are identical in physical form and electrical connections; hence most of the devices which are compatible with SDSCs are also compatible with SDHC Memory Cards. Some devices may, however, have a compatibility issue because SDHC cards come pre-formatted with a FAT 32 file system. This compatibility issue can be easily avoided by updating the firmware of the host device. 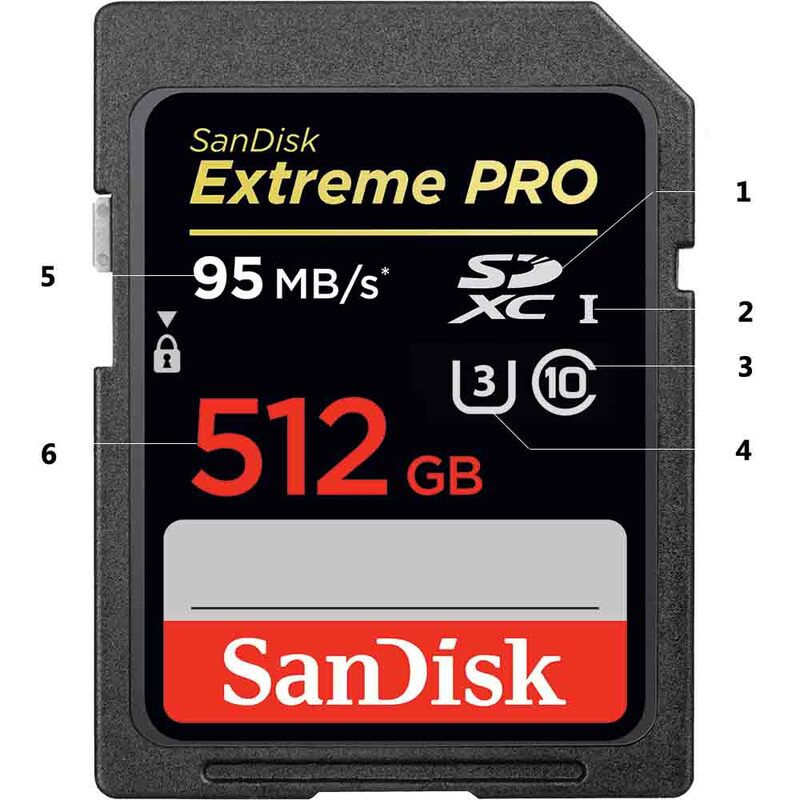 SDXC cards can theoretically store up to 2 TB of data. Also, Microsoft’s exFAT comes as a mandatory file system on the SDXC cards. 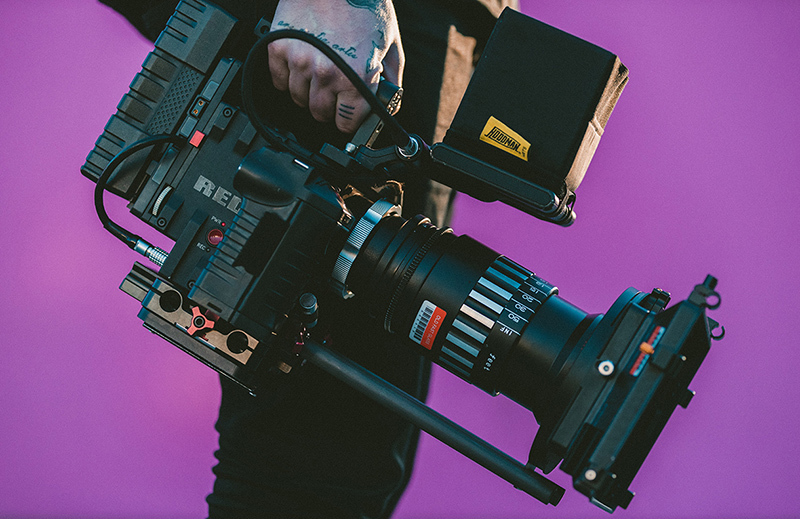 Since version 5.0 was introduced in February 2016, SDXC cards has been supporting higher speeds up to 90MB/s allowing 8K video and other high-speed data recordings. SD Memory comes in three physical sizes as well. Namely Standard, Mini (introduced in 2003) and Micro ( introduced in 2005). 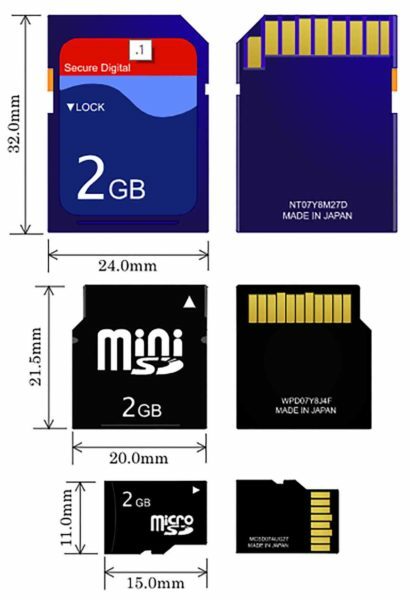 Like in the standard sizes, mini and micro SD Memory Cards are also backward compatible. This means devices which support mini SDHC also support mini SDSC cards. However, mini SD Memory Cards soon became a size that was no longer needed since most of the host devices either used a full-size standard SD card (in professional cameras) or a micro SD card (in smaller devices like cell phones and drones). Mini SD Memory Cards were discontinued in 2008. Now coming to the most important part of this discussion, speed. The speed with which the SD Memory Card is capable of reading or writing data on the card. Since I am describing this from a photographer’s point of view, let me explain it this way. Imagine a bucket with a hole at the bottom. This bucket is your camera’s buffer. Whenever you take a picture the camera records some data using the sensor and the dumps it in this bucket. The hole at the bottom of the bucket represents the speed of your Memory Card. Larger the diameter of the hole, faster the data flows, faster the buffer bucket clears and finally faster the data is transferred to the Memory Card. Read this part one more time, if you get this straight the rest would be self-explanatory. Let’s take a situation where you are taking some JPEG images. As you already know JPEG is a highly compressed format, hence the file sizes are not very large. For a comprehensive understanding of image file formats and their uses, read Image File Formats | A Definitive Guide. Because the file sizes are rather small maybe you can get away with a slower Memory Card here. If, however, the scenario changes, like if you are shooting RAW images on burst/continuous mode (something professional sports or wildlife photographers do very often), the camera buffer fills up quite fast because RAW files are large. Coming back to the bucket and hole analogy, if the bucket fills up fast and the hole underneath is not wide enough to transmit the data to the card at the same rate or faster rate, the camera would have no place to keep the recordings and hence would have to stop until the buffer clears. You simply have to wait now. These may be those precious moments when you simply cannot NOT take pictures. The same theory applies to video recording as well. Films shot at lower resolutions have naturally lower data requirements, hence it may be okay to use a slower SD Memory Card. But let’s be honest; NO one now thinks of shooting any film lower than at least 1080p. Most high-end smartphones shoot 4K video. We are not going back in time, are we? The principle is hence very easy. 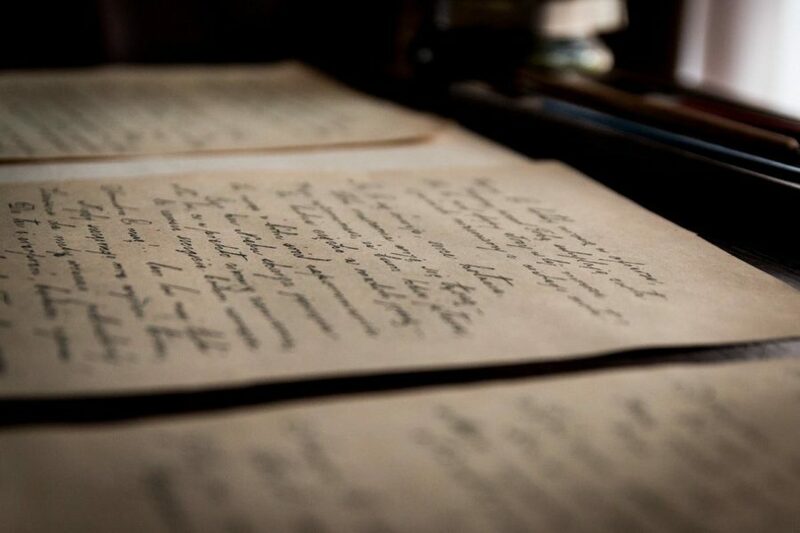 Better the quality of photographs and film you shoot, generally larger would be the files. Larger files would lead to use up the camera buffer bucket faster and hence you need a wide enough pipeline of Memory Card speed to transfer the data from the buffer to the card. If the SD Memory Card inserted into the camera doesn’t match the rate (if not surpass it) at which the data is filled in, the camera would simply stop recording until the buffer clears. Trust me, you do not want to be the guy with a buffering camera! SD Memory Card manufacturers are at constant war with each other over market shares. They absolutely never miss an opportunity to add a large number on the face of the card so that you would buy it. If it is a reputable company perhaps it is not false advertising but sometimes a little misleading. It may be completely different than what you think that number to be. You, as the consumer and more importantly the user of the card, should know exactly what those numbers mean. Secure Digital EXtended Capacity. The SDXC cards are the ones which, as described earlier, have storage capacities of more than 32 GB (up to 2 TB) and come with Microsoft’s exFAT as the mandatory file system. They are particularly large cards and generally have fast transfer rates. The card here bears a UHS- I Bus Logo which means it has the spec version 3.01. There are also UHS-II and UHS- III. You will find more details in the box below. This specific card is classified as a C10 or Class 10 card. SD Memory Cards are classified under the Class Rating system depending on the sequential read or write speed. 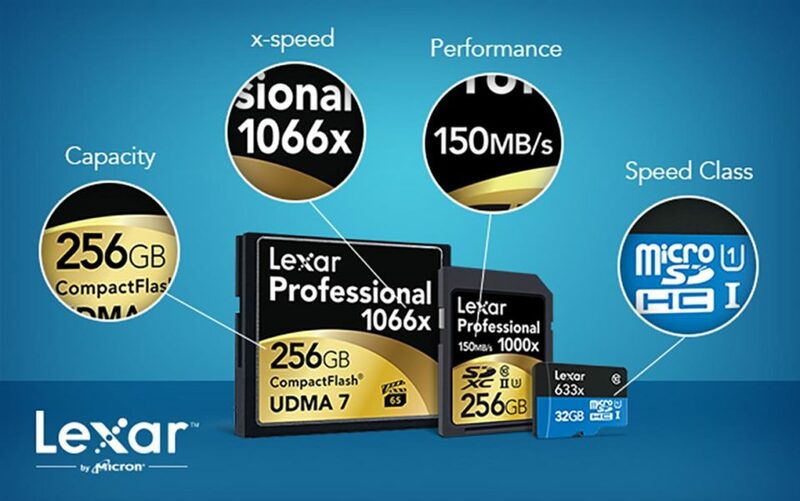 Speed Class Ratings guarantee the minimum write speed of the Memory Card. There are four Class Ratings – C2, C4, C6 and C10. A C2 card guarantees a minimum of both read and write speed of 2MB/s, similarly a C6 card guarantees 6MB/s and henceforth. 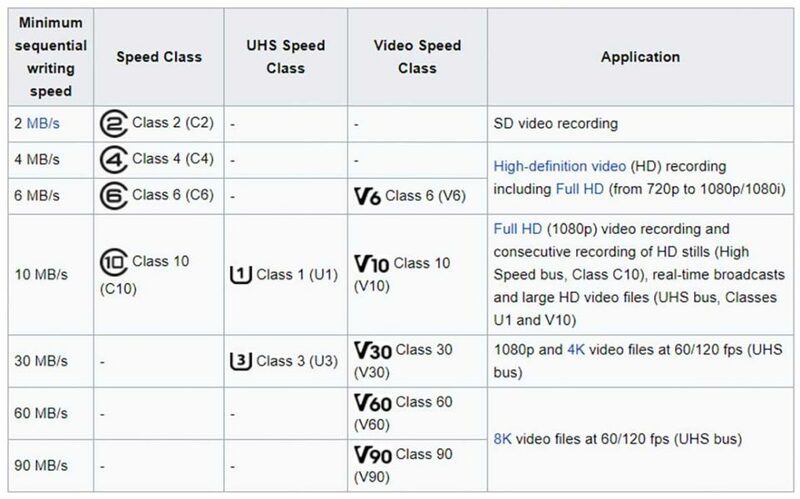 Like the Class Speed Ratings, UHS is also a speed rating. Class rating only rates cards up to 10 MB/s. UHS stands for Ultra High Speed. It rates SD Memory Cards depending on the minimum read/write speed as well. UHS- I guarantee a read/write speed of 10 MB/s, similarly UHS-II symbolizes a speed of 20 MB/s and henceforth. This is written in bold on the face of the card and hence must be important, don’t you think? Not so much. This is actually the read speed of the card. The speed with which the data on the cards could be accessed when inserted in a computer. It just helps to transfer files off the card to the computer faster. Is it good to have a card that has a faster read speed ?….sure! But it really wouldn’t be the first thing that I look for in a card. In fact, it really doesn’t matter when you are taking photographs off the cards onto the computer and it takes a couple of minutes more. What counts is the write speed of the card. The speed with which data could be written on the card from the camera. Manufacturers deliberately choose to display the read speed in bold on the SD Memory Card because invariably the read speed is always more than the write speed of the card. Don’t be fooled by this little gimmick next time. Like I said earlier, it is not false advertising but it is a little misleading (on purpose). This you already know is the storage capacity of the card. The amount of data the card is capable of storing. 512 GB in this case. However, in most cases, the cards DO NOT have the full amount they are advertised for. Generally, the actual storage capacity is anywhere from 10 to 20 percent less than what is written on the face of the card. Some card manufacturers adopted the X-rating used in the earlier CD-ROM drives instead of C or UHS speed ratings. Seriously now, the CD-ROM drive speed was used as a unit against which the actual speed of the cards was measured and displayed. Lexar was such a manufacturer which used the X-ratings for a long time. The CD-ROM drive had a speed of 150 KB/s. So essentially, a Lexar card with a 1066x speed rating is a 159.9 MB/s card (1066 x 0.15). I guess a larger number printed on the face of the card does make the customer think that it must be a hell lot faster than the other cards. Large numbers are good for marketing nevertheless. Like all technologies, cameras and video recording devices are evolving every day. More and more companies are introducing products which can make photographs and films of ridiculous resolutions. More resolution means larger file sizes and consequently, the demand for faster transfer speeds to sustain that. It is a constant uphill battle to fit in more and more data in as little footprint as possible. This is also the reason why prices of Memory Cards fall so significantly in such quick almost clock-like succession. First introduced in late 2009, Compact Flash was actually a resurrection of the older format that was once eliminated from the market by wait for it…..SD Memory. It uses the same Serial ATA (SATA) bus that a PC uses. 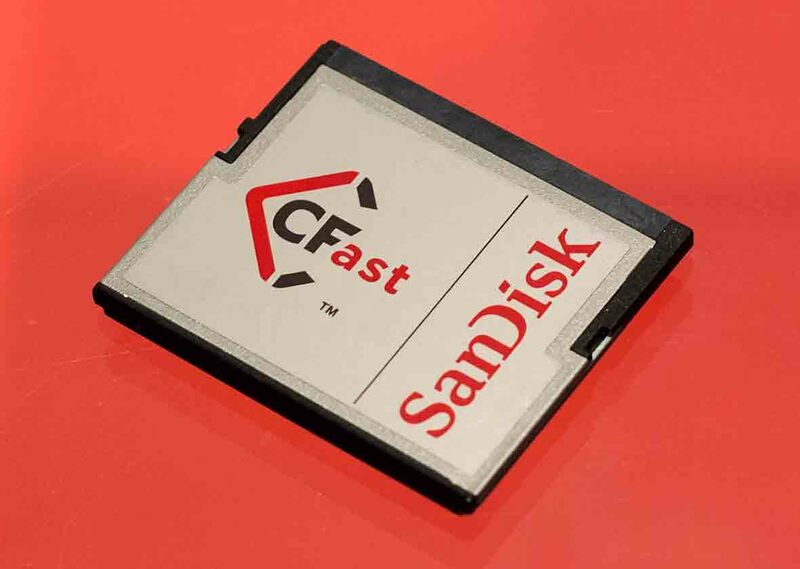 Owing to this, CFast cards can sustain speeds of nearly 600MB/s which is similar to the high-end SSDs these days. In comparison, SD Memory Cards redlines at just half that speed. XQD Cards: XQD cards developed by the same Compact Flash Association in 2010 is currently winning the speed war. It uses PCI express bus as a data transfer interface and clocks out more than 2 TB of data storage. Since the introduction of version 2.0 in 2012, XQD has offered read and write speeds of up to a 1000MB/s, thanks to PCI Express 3.0. Sony and Nikon were the first adopters of the new technology. Sony’s broadcast camcorders XDCAM and XDCAM EX will both support XQD cards. Nikon, on the other hand, introduced XQDs in its high-end DSLR cameras like Nikon D4, Nikon D4s, Nikon D5, and the Nikon D500. In some cases, Nikon offered two variants of the same camera, one with and one without the XQD support. For a more comprehensive comparison of Memory Cards, you may refer to this. If there is not much of a price difference always try to buy two smaller cards rather than one large card. This reduces the chance of losing too many files if something happens to the card or if it somehow malfunctions. You can always use an adapter to use the micro SD card on your cell phone with your camera if you suddenly fall short of space sometimes (It saved me once big time). When inserting an SD Memory Card, always make sure that the lock is accidentally NOT engaged. This is very notorious and happens more frequently than you think. Just be a little more vigilant. You don’t want to go for an entire day’s shoot and come back to find that your card was locked all along. I hope now you have a better understanding of Memory Cards in general and know what to look for when buying one. Not just for photography, it might come in handy in many scenarios. After all, we have already stepped into the digital era and Card Memory is not going anywhere soon. Good luck and keep shooting amazing.